Sustaining a workplace injury is painful for the worker, the worker’s pocketbook and the employer. One of the most difficult and stressful decisions after a workplace injury is deciding when to return to work. The injured worker may risk further injury if they return too early but they may face other issues, such as financial strains if they take too long to return. It is best for everyone involved to find the right balance. Returning to work after receiving the green light from your doctor isn’t as easy as it seems but it can actually improve one’s health and well-being. Excess absenteeism from work can also mean increased difficulty returning to work. Recovery from a work injury many times entails resting in bed with a large decrease in physical activity. The body gradually allows muscles to shut down due to the extended period of inactivity. Chances of a speedy recovery improve when there is increased physical activity such as getting dressed and traveling to work. Incidental exercise increases blood circulation and movement through the day that helps improve stamina and mobility. Many people take a lot of pride in their careers and the work that they do. When an injury keeps a dedicated worker from doing their job, that individual may feel they are no longer productive. Furthermore, their injury may limit their ability to do household duties due to the severity of their injury adding to the negative mental state. Not to mention the majority of people who work have a routine of getting up and preparing themselves to go to work daily. Removing these routines from a person’s daily life because of a workplace injury can cause anxiety and depression. On the other hand, returning to work after an injury will get the worker’s spirits up because they have something to look forward to. Instead of staying home all day dwelling, they will feel like they are getting their life back on track. Although many injured workers turn to family for support, colleagues play an equally important daily role in their support network. Getting employees back to work after an injury means they will get to interact with their colleagues, which may have turned into friends. The worker will feel happy with the social support of their friends at work. Communicate. The timeline of when to return to work will depend on your injuries and the advice of your doctor. Once you have a plan with your doctor, discuss returning to work with your employer to set expectations at your earliest opportunity. A sustainable return to work is more likely when an employer and employee work together to achieve a gradual return to work. It is important you show concern of being away from work and don’t wait until the last minute to do this. Do not go back before you are ready. If your doctor has not cleared you to return to work, do not risk another injury by returning too soon. If you can work, work. A big mistake is refusing to return to work when you are able. Sure, the time off may seem like paid time off but an injured employee who takes time off when it is no longer necessary risks having their worker’s compensation claim denied or delayed. This also means that you can lose any further compensation and benefits. To make things worse, your employer can terminate you for your refusal to work. Follow the guidance of your doctor when it comes to going back to work. Each type of illness or injury, along with the extent to which physical changes occurred, will affect your return to work activity. Keep in mind that worker’s do not need to be fully recovered to return to work. There are instances when accomplishing a complete recovery doesn’t occur until the worker returns to work after an injury. Communicate with your Workplace Injury Attorney when your doctor has ordered you to return to work. Your attorney will have your best interests in mind and will provide you with the best advice to your specific situation by ensuring that you are following your doctor’s orders. Keep a copy of restrictions with you at work. Your doctor may approve your return to work on light duty. These restrictions need to be taken seriously to avoid affecting your recovery. Take the documentation that lists your restrictions for proof. Do not do work which exceeds the restrictions listed by your doctor. If your employer requests that you perform work duties that have not been cleared by your doctor, decline and show your documentation that outlines your restrictions. Employers cannot make assumptions about a condition to decide whether an employee can do a particular job. If your employer persists, contact your Workplace Injury Lawyer right away. Document everything that could affect your case. Employers cannot retaliate or discriminate because of a workplace injury. Make sure to document if you start to recognize that your employer’s actions may constitute discrimination or punishment for your injury. Include as much detail as possible including the date and immediately report it to your lawyer. Consider changing the role. 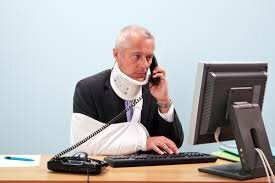 If an employee was injured at work, they might feel uneasy about returning to work because their previous role or task caused the injury. A change to their role or responsibilities can take away the anxiety that they may injure themselves again. Be positive! Try your best to stay motivated to help yourself get back on the job. If you or a loved one suffered an injury at the workplace, you may be entitled to compensation. Don’t go another moment without legal representation.